The world’s first touchscreen marine stereo with built-in Wi-Fi, the Apollo RA770 has redefined audio excellence with revolutionary technology and innovative design including Fusion’s Digital Signal Processing, PartyBus, over-the-air software updates, a one-piece glass display and more source options than ever before. From the kick drum to the eardrum, Apollo has made it inherently simple to customize your audio entertainment for superior sound quality in any area of your boat. World’s First Marine Wi-Fi Stereo: High quality audio streaming is now available via Wi-Fi, delivering a higher data transfer rate in comparison with Bluetooth. Enjoy perfectly synced music throughout your vessel by wirelessly connecting multiple Apollo stereos via PartyBus. Digital Signal Processing (DSP): A technically superior listening experience made simple, Fusion DSP produces superior sound quality in every environment. Precisely calculated loudness curves optimized for the human ear ensure quality, full range audio at every volume level, while the feed-forward limiter anticipates a peak in the audio and adjusts the gain to make distortion, at any volume level, a thing of the past. Using environmental information and customized Fusion speaker profiles, you can now achieve customized, optimized audio for any area of your boat, resulting in an entertainment system that is perfectly tuned for premium audio reproduction, and programmed to protect your system season after season. Setting up your DSP profiles is made simple with the free Fusion-Link app, or with a custom-made Fusion-Link PC app for OEM boat builders. With just a few clicks, you can set up the preconfigured DSP profile once and get back to enjoying what you love on the water, while listening to high quality audio customized for your ears and the environment. Glass Touchscreen Display: The future of marine audio entertainment has arrived in the Apollo RA770 with its 4.3” LCD colour touchscreen display. Simply tap the screen to pause and play, or swipe through your playlist to your favorite song – fiddling around to locate the right button is now a thing of the past. Over-The-Air Software Updates: The Apollo Series is intelligently simple and always up to date, thanks to the over-the-air software updates available from your smartphone or compatible device via the free Fusion-Link app. True-Marine™ Designed and Engineered: Built on Fusion’s True-Marine design philosophy, the Apollo RA770 has an impressive IPX7 rated water resistant front panel, and has been tested to a high level for protection against salt fog, temperature, vibration and UV protection. 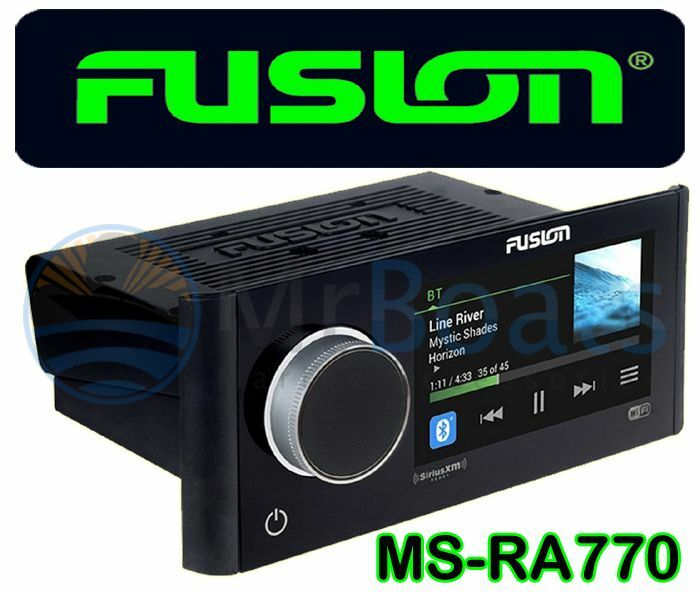 Fusion-Link: The industry standard protocol for on-water audio integration and control, Fusion-Link enables control of your entertainment directly from partnered marine Multi-Function Displays, compatible Apple or Android devices, and Garmin watches. With multiple control options, no matter what you are doing on your boat, you can always be in control of your audio entertainment. Multi-Zone Technology: Four independent audio zones are available for a customized listening experience across your vessel, each with advanced localized menu controls including volume limits, zone naming, disabling zones and more. Note: Subwoofer and full range line outs require additional amplification. Water Resistance (IPX rating) IPx7 from the front panel when installed correctly.